I like these because they have a vintage look, and can be made into a necklace, hair accessory, pin, or even a magnet for your refrigerator. 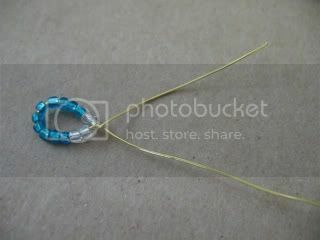 Cut a piece of wire, 9 inches long. string on two of the assorted color beads, (I used clear,) then string on 10 of your dark color beads and 2 more of your assorted color beads. 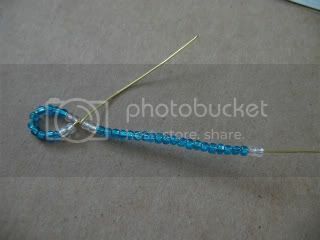 Push the beads until they are about 2 inches from the end. 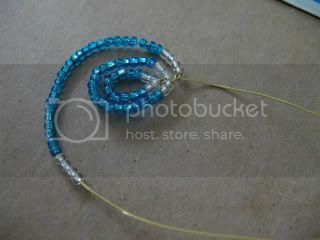 Form a loop with the beaded portion and twist once to hold the beads in place. 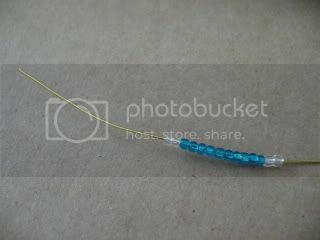 Working with the long end of the wire string on two assorted color beads, 20 dark color beads, and two more assorted color beads. 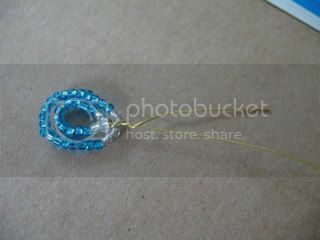 Form the beaded section into a loop going around your first loop, and twist to hold. 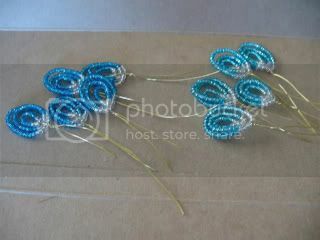 Working with the long section of wire, add 4 of the assorted color beads, 25 dark beads and 4 more assorted color beads. Form into a loop and twist. You have now completed one petal. Follow the steps to make a total of 5 dark color petals, and 5 light color petals. Stack 5 petals together alternating light and dark. Twist the stems together. Put on stack on top of the other and twist the stems together. Spread the petals out, overlapping them. 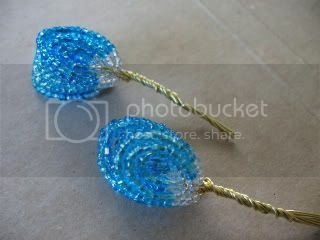 On the back of the flower, curl the wire around, flat to the flower and trim. Hot glue a piece of felt over the wire. 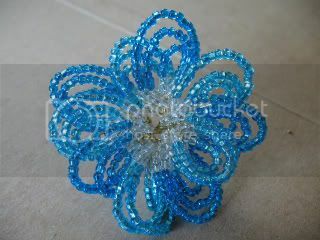 On the front of the flower, put a dab of hot glue in the center where the wire is showing. 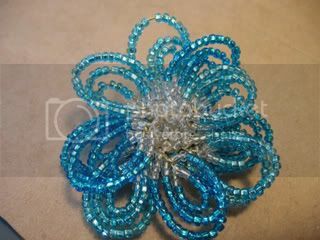 Sprinkle on some of the assorted color beads, a rhinestone or a large bead. 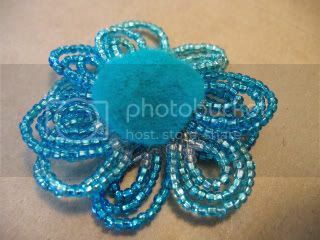 Now you can add a pin back, barette, or magnet to make the flower into what ever accessory you want. Ah! Lovely Lovely. Thank you for sharing. I really like this! I'll say it again - book, book, book! this is such a lovely idea, beautiful work! Oh these are gorgeous! 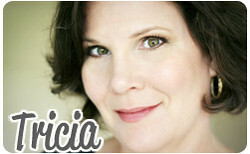 I'd love to link to these if you didn't mind! Thank you for the tutorial! I'm going to try these for sure! Thank you.A brilliant idea sure to try. So great! I just might try this tonight! I like your design. I am really impress. This is just what I needed for a project to take to the county fair! Thanks! I finally gave this a shot this morning. I was short on beads so I could only make 6 petals total, but it still turned out wonderfully. 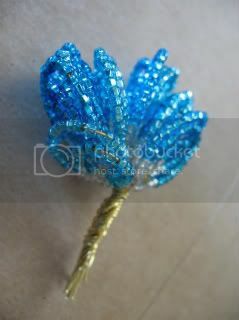 My daughter will wear it in her hair to church today. Thanks so much! a really fabulous flower. i love it! i'm linking. i hope you'll agree. what a nice tutorial. thanks for sharing. This is beautiful... simply, simply beautiful. I love it! Thanks for sharing!!! 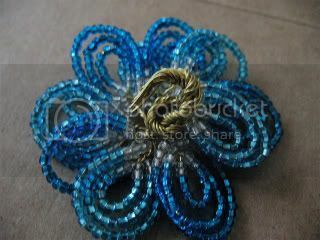 I am mostly looking for jewelry beads to make my own jewelry and I think it will bring the creativeness in me.